Arden Grange Sensitive Adult Dog Food (White Fish & Potato) is a complete and nutritionally balanced diet for dogs with sensitive skin, delicate digestion or dietary intolerances. Made with fresh ocean white fish as an easily digestible source of protein, Arden Grange Sensitive has been designed to support your dogs’ skin and coat; containing high levels of Omega 3 & 6 which may alleviate inflammation and suppress adverse immune reactions. 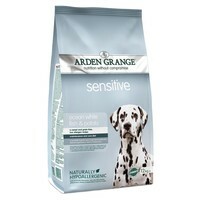 Arden Grange Sensitive is a grain-free and low-allergen diet that will provide all breeds of dog with a hypoallergenic, wholesome diet full of natural goodness. My Labrador has Endocrine Pancreatic Insufficiency. This can be a life threatening disease and is very difficult to manage, as you will know if you are reading this and have a dog with EPI. We tried many different brands and ended up home cooking for Gemma because her food needs to be grain free, low fibre, low fat and not containing any red meat. After discussions with the Nutritionist (Vanessa Bird) at Arden Grange we tried this and are now on our third bag. I own 2 Italian Spinoni; the youngest,aged 2, has had a sensitive tummy and a bit of an itchy skin ever since I bought him and I must have tried nearly every type of food for sensitive digestions etc. that there is. One food I tried worked to a certain extent but I still wasn't happy as the tummy upsets still occurred now and again and the itchy skin didn't improve. I think Arden Grange Fish & Potato was probably my last hope, I only wish I had tried it earlier; he's been fed on it now for about 6 months and his digestive problems have completely gone. Also he's stopped scratching so all in all a great success! I would recommend this Arden Grange fish & potato to anyone. I'm so impressed with it I've decided to feed it to my other Spinone also. Our two Golden Retrievers have suffered with digestive disorders since they were puppies. We have tried pretty much every food and supplement going to prevent recurring diarrhoea. They are now on their 3rd bag of AG Sensitive. Apart from loving it they also seem to be free from loose stools for the longest time in their lives.